According to the Chinese calendar, 2014 is the Year of the Horse. According to the e-mails I’ve received lately, it’s also the Year of the Colon Cleanse. Recently, several not-to-be ignored hot-deal coupons landed in my inbox. I’m not going to name the companies who offered these unbelievable opportunities, because they might get inundated with copious requests to provide everlasting intestinal fortitude. Here’s deal #1 - for only $89 (an almost $200 value) you’ll get a two-day Juice & Food Cleanse System. This “system” is a perfectly measured portion that you ingest five times a day. It could be tea, juice, a packet you mix with something, a protein shake, soup, or any combo of the above. Unfortunately, when I browsed their website, I never did figure out what came with the two-day special. But, hey, the system was created by “celebrity trainers” so how bad could it be? I mean, if we can even come close to looking like Biggest Loser work-out gurus Bob, Jillian or Dolvet simply by cleansing instead of exercising for eight hours a day, why not? Problem is, I can’t afford to spend that much money on potions, powders and teas. $311 a week buys a lot of raw broccoli and spinach, which would probably do the trick just as well. Hot deal #2 - for a mere $45 (a $95 value) you can enjoy one Colon-Hydrotherapy Session. WOW! Can you beat that for motivation? 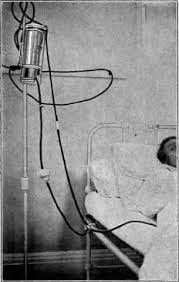 Not to be confused with the super-scope, colon hydrotherapy is not performed by a medical doctor. The Certified Colon Therapist (really? they have certification for that?) “is equipped to sniff out and snuff out sickness's underlying causes, be they hormonal imbalances, stress, or large carnivorous birds”. Ya can’t make this stuff up, folks. I mentioned this idea to my hubby, Garth, after I read about it. I admit it - I’m fast. A fast car driver that is. If you were a teen in the 60’s you might recall Jan & Dean recorded “The Little Old Lady from Pasadena.” I always thought it was kind of a dumb song, until now. Because the reality has set in - I’m her. The town where I live has a large "senior" population. Statistically, I’m one of them. Drivologically, not so much. 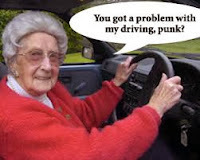 My motto: never drive slower than your age. I think I once heard my husband mumble under his breath that the only thing faster than my driving is my mouth. Can’t confirm that’s what he really said, ‘cause he’s still alive. It’s not my fault I drive so fast. I’ve tried to slow down. In fact, I recently completed a twelve step program for fast drivers sponsored by Accelerators Anonymous. At first I thought my problem was physical. However, a visit to my podiatrist assured me that my “lead foot” was not a disease…and not curable. This was further confirmed when my daughter (age four at the time) pointed to a man on the tv and said, “Look, Mommy, he drives like you do.” She was watching a Speed Racer cartoon at the time. My lead foot affliction makes me resort to great lengths to avoid law enforcement interception. Fortunately, I’ve honed my speed detection skills down to a science. There’s a dispatch radio in my car that monitors highway patrol car locations. If that fails, I can rely on my hawk-like rapid eye movements that dart from rear view to side mirrors twenty-five times per second. This allows me to spot a hidden patrol car a half mile away. Once spotted, I can moderate my slow down speed to within ten feet of any radar device. Sweet. Even with all my evasion skills, I did get caught once. The nice officer said I should considered changing the name on my drivers license to Marcia Granetelli. I like it. If you’ve made New Year Resolutions, raise your hand. I gotta ask … what’s the point? 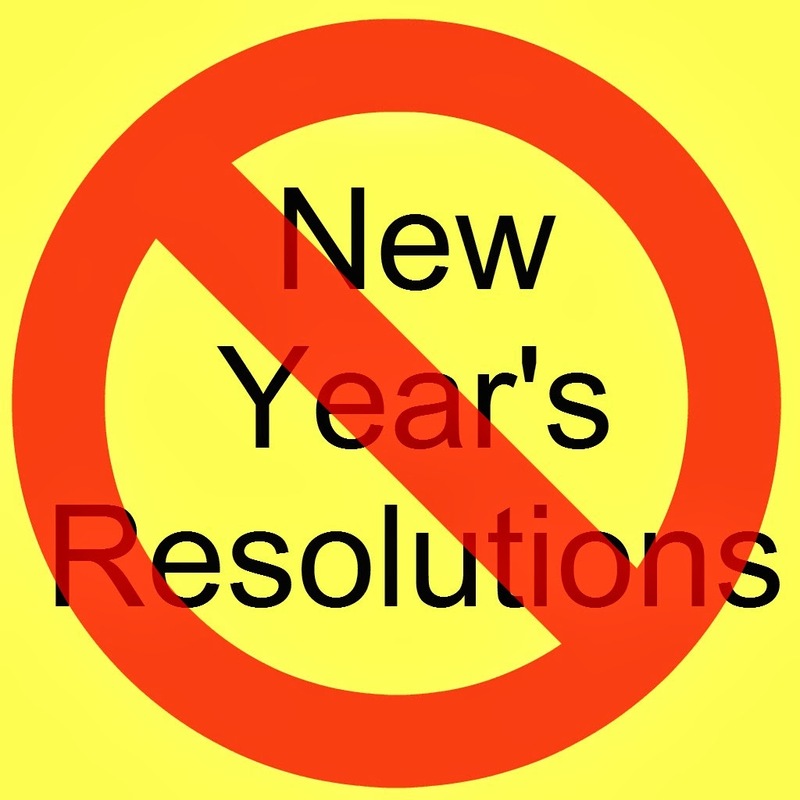 Do you know anyone who’s actually kept a resolution they made for a full year? I think I tried it once, for about ten minutes. According to Parade magazine, we have the Babylonians and The Roman Empire to thank for this not-so-favorite holiday tradition. How they managed to scroll resolutions while trying to conquer every country on the planet is beyond me. 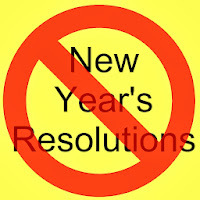 Parade also shared that the success rate of keeping your resolutions is eight percent. I would have guessed more like negative two percent. This prompted me to research more resolutions info on the web. I know, I should probably get a life, but it beats putting away Christmas decorations. I found out most people make the same resolutions every year - lose weight, reduce stress, spend less, save more, ya-da, ya-da, ya-da. The British “Social Entrepreneurs” offered some interesting resolution twists, however. Of course, I have no idea what a social entrepreneur is, but heck, they sure intend to make a difference. For instance, one person is “going to be focused on understanding what spreading social innovation looks like in different contexts, particularly where actors have different levels of control – what are the distinct challenges associated with growing a practice through an umbrella organization, or trying to replicate a specific intervention in new contexts?” Blimey! There was one social entrepreneur who actually made a resolution I could relate to, “My resolution is to seek out good wine and in particular, co-operative wine.” Right on! Let’s face facts, no matter where we’re from, we hate making those lousy resolutions and we hate ourselves even more for not keeping them. So again, what’s the point? To that end, I’ve decided to share my Top 5 resolutions I have no intention of keeping. pound box of candy in one sitting. 2. Tweet, face,chirp, link, pin, etc. more. Maybe if I understood why I needed to do this, I might be motivated to try. any way, shape or form. possibly ask a woman to sacrifice? When ya don’t keep ‘em, ya just don’t care.